With the end of the year rapidly approaching, I thought it may be a good time to work on some year-end wrap-up posts. In book news this year, I discovered audiobooks. One reason I had never considered audiobooks a viable option for me was the price, they are really expensive! However, due to a bookish forum I am a part of on Facebook (specifically the Owlcrate subscribers forum) I discovered the Overdrive app which allows me to loan audiobooks from my local library for free! What a revelation. How does it work? It is so simple! I browse their electronic library, check-out the book I want and download it directly to my phone on loan for 14 days. Now I can listen to books while walking my dog, driving to and from work and cleaning around the house. Having made this discovery has really enhanced the number of books I can get through per year and has truly become a staple of my every day life. 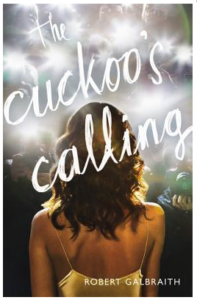 One of my favorite books that I have read this year was actually my 2nd audiobook – The Cuckoo’s Calling by Robert Galbraith (the pen name of the beloved J.K. Rowling – yes, that J.K. Rowling). Originally published in 2013, this gritty crime novel introduces us to the gruff and brilliant detective, Cormoran Strike and is the first book in a currently four book series. As an audiobook the narrator they chose was wonderful; absolutely perfect for this story. I hope he continues on as narrator for the rest of the series. The story itself was right up my alley. I love characters like Cormoran – gritty and flawed yet super intelligent, humble and genuine. I really enjoyed the chemistry between Cormoran and his accidental assistant, Robin. I can’t wait to watch their relationship grow as the series continues. The mystery was very strong – it never let up and the police procedural aspect with which Cormoran went about his investigation was spot on, I felt. I will definitely be continuing with this series! Well done, JK! Next > Mr. Mercedes – Where it all begins….